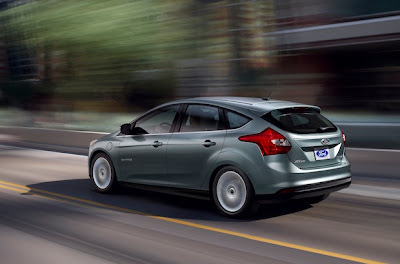 Starting today, drivers that want to go completely gasoline-free will be able to configure the all-new 2012 Ford Focus Electric online at Ford.com and place their orders with a Certified Electric Vehicle (EV) dealer. "Today is an historic day, as Ford opens up the order banks for the company's first full production, all-electric passenger vehicle – the Focus Electric," said Chad D'Arcy, Focus Electric Marketing Manager, Ford Motor Company. "The all-new Focus Electric is an important part of Ford's overall strategy, bringing still another option to customers who want a car that is fun-to-drive, easy to own and fully electric." Drivers interested in learning more about the 2012 Focus Electric will be able to see detailed product specs and virtually build and price one at a dedicated online website: http://www.ford.com/electric/focuselectric/2012/ starting Wednesday. Focus Electric comes standard with: MyFord Touch with 8-inch touchscreen; two driver-configurable 4.2-inch color LCD displays in cluster for unique EV driving screens; MyFord™ Mobile App (for remotely monitoring and scheduling battery charging with owners' smartphone as well as remote start); HID Headlamps; 17-inch aluminum wheels, ambient lighting, seats made from 100-percent recycled material; Rear Camera with Rear Parking Sensor; Intelligent Access with Push-Button Start; MyKey®; voice-activated Navigation System; Particulate Air Filter; hands-free SYNC® Bluetooth telephone connectivity with Traffic, Direction and Information Services; electronic traction control; Sony®-Branded audio with nine speakers; SIRIUS® Satellite Radio and HD Radio™. The only options on well-equipped Focus Electrics are leather seats and two paint colors. "Ford believes driving electric doesn't mean consumers should have to sacrifice on driving experience or vehicle quality," said D'Arcy. "The Focus Electric comes with more standard features than any other comparable all-electric vehicle." In addition to silently cruising past gas stations, Focus Electric drivers will never need oil changes or any of the other service required on gasoline engines. Focus Electric exclusively stores energy in an advanced lithium-ion battery pack. The battery pack uses liquid-cooling to help ensure a long-life and optimal performance under all weather and driving conditions. The Focus Electric's battery can be recharged in just over three hours using a 240-volt charging station, about half the charging time of the 2012 Nissan Leaf. Drivers also can top off the battery any standard 120-volt outlet using the included charging cord. The online site also provides potential customers the ability to find the location of their nearest Ford Certified EV dealer so they can place their order. A limited number of Focus Electrics will first be available in California and the New York/New Jersey regions. Availability of the Focus Electric will expand next year to the remaining 15 launch markets as production ramps up. The 19 launch markets include: Atlanta, Austin and Houston, Texas; Boston, Chicago, Denver, Detroit, Los Angeles, San Francisco, San Diego, New York, Orlando, Fla., Phoenix and Tucson, Ariz.; Portland, Ore.; Raleigh Durham, N.C.; Richmond, Va., Seattle, and Washington, D.C.
Markets were chosen based on several criteria, including commuting patterns, existing hybrid purchase trends, utility company collaboration and local government commitment to electrification.